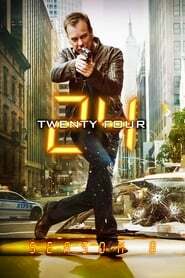 Season Eight, also known as Day 8, is the final season of the American serial television series 24. Filming for the season began on May 27, 2009, and it premiered on January 17, 2010 with a four-hour two-day premiere. The two-hour series finale aired May 24, 2010. The season’s storyline begins and ends at 4:00 p.m. In May 2013, it was announced the series would return as a limited series containing 12 episodes to debut in May 2014.